Let me just start by saying that we LOVE full size vans. Mich and I totally geek out seeing cool conversions and drool every time we catch sneak peaks of the insides of old VW mini buses at a campsite. We are suckers for wooden interiors and sweet paint jobs. 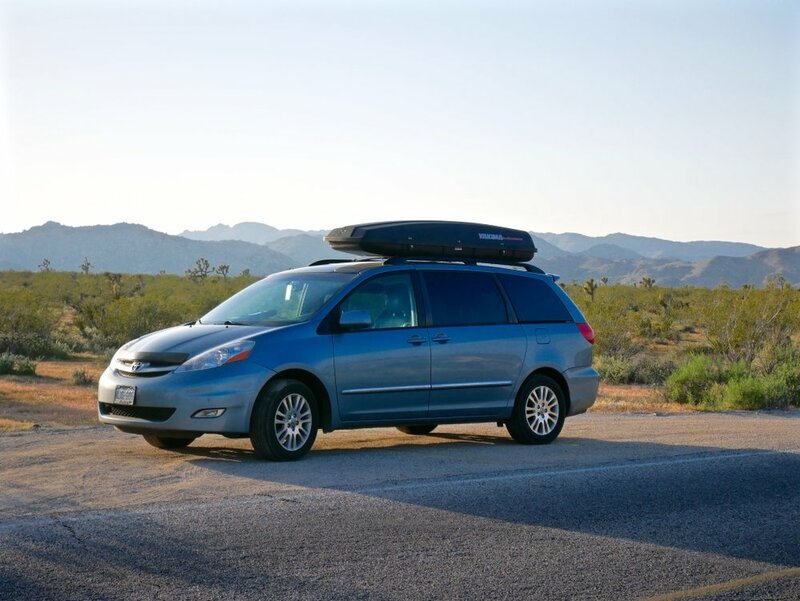 However, mini vans do have few key advantages over larger campers such as overall cost, fuel economy, and reliability. Tinted windows: We were lucky in that Moose came with factory installed, tinted windows for the back seats. But even she did not we probably would have considered spending some money on this. It’s super comforting to be working/hanging out in the back without even having to draw our curtains to have some privacy. However, for sleeping purposes even the best window tints won’t cut it. Tints, only together with blackout curtains can seal yourself off from the outside world and keep you sleeping safe and sound. With this combination tho, we could be sleeping outside your front door and you’d probably never know it. You might actually want to look outside your window just to double check. Blackout curtains: Like Mich mentioned in our video tour this might just be one of the most important features of your conversion. We installed 3-layered, insulated, DIY blackout curtains all around our sleeping compartment. These helped us stay unnoticed everywhere from downtown San Francisco, to middle of nowhere truck stops and sketchy Walmart parking lots. Tutorials on how to make and install your own curtains are forthcoming so be sure to subscribe to the blog here to get the info as soon as it’s online. 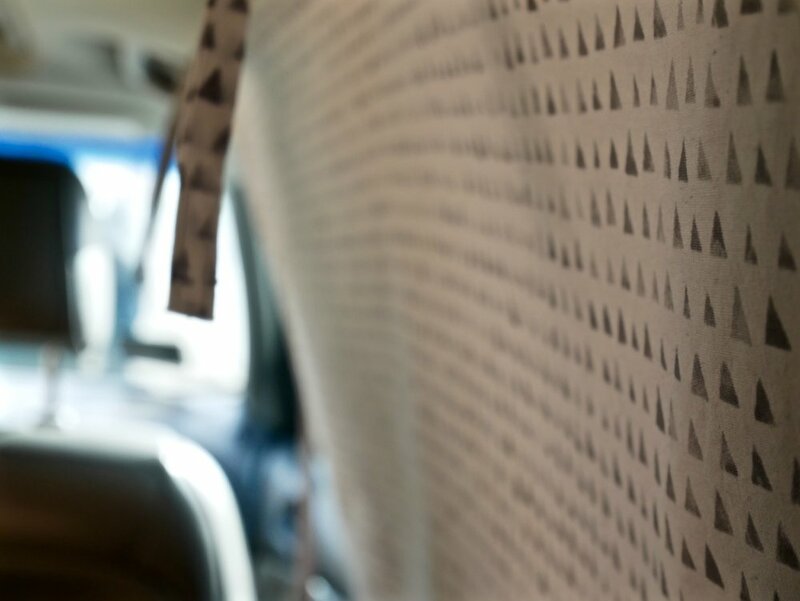 Windshield sun shades: We did not have these when we started our trip but quickly realized the obvious benefits of having them on both on the front and back windshields. Besides serving as insulation they are a tremendous help with privacy as well. Since you probably won’t have your front and back windshields tinted, putting them on overnight will block the view of the driving compartment and of the privacy curtain between your front seats and living/bed room. Modular/Removable awnings; There are some really cool professional awnings you can buy and have installed on your vehicle. They are nifty and pretty inexpensive but our philosophy is that the more permanent structures and “stuff” is hanging off your vehicle (firewood, camping gear, spare tires etc.) the more obvious it becomes that you are in the game for the long term. We instead prefer solutions that are budget friendly, multi purpose and modular. Our DIY awning consist of nothing more than a couple extendable poles, a rain tarp and clamps from Home Depot. All super cheap and easily packable. We’ll do a tutorial on this as well so again, do not forget to subscribe to the blog here. No sticker policy: Don’t get me wrong, I do LOVE stickers….as a matter of fact Mich often jokes that the sole purpose of touring the west for me was to collect as many brewery/outdoor gear/national park stickers as possible. As tempting as it is to turn Moose into a mobile, avant-garde art piece we’ve made a conscious decision not to decorate her. Opinions might differ on this but we think that keeping our home “clean” makes us more invisible, therefore safer. There are few more obvious signs of living out of a vehicle than plastering your personal philosophy, political stance and choice of beverages on it. Roof rack: If you carry as much sh**t….I mean gear as we do, you no doubt will need one of these. But besides hauling your mountain/ocean gear it will also allow you to keep the inside of your vehicle less cluttered aka NOT looking like you’re living out of it. Also it should alleviate the need to strap crap on the roof and outside of your vehicle. And again, what can be less conspicuous than a minivan with a roof-rack….maybe throwing some stick figure family stickers on the back. Don’t eat where you sleep: Avoid cooking/hanging out in the same area you plan on sleeping in. It might be obvious, but the easiest way to draw attention to yourself is busting out your propane cooker or doing dishes outside of someone’s front yard. Clearly, this is not an issue at campgrounds or out in the wilderness, but when we do plan on sleeping at a truck stop or urban environment, we first always scope out the area we'll sleep in. Then we find the closest city park or rec. center to do our cooking/evening routine and only go back to our sleeping area once we’re ready to climb in the back.